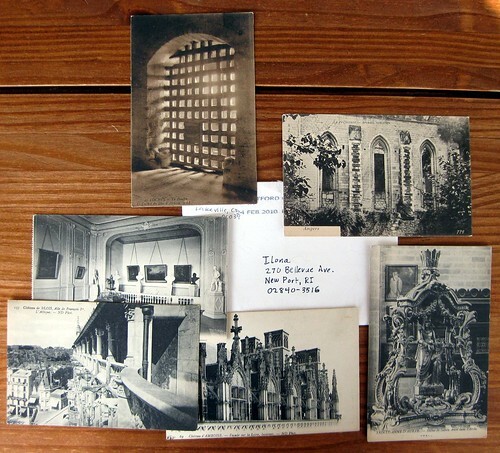 A very generous blog reader in Connecticut sent me these postcards. If I recall correctly, the writer supposed that a relative had brought them home as souvenirs after a tour of military service overseas. 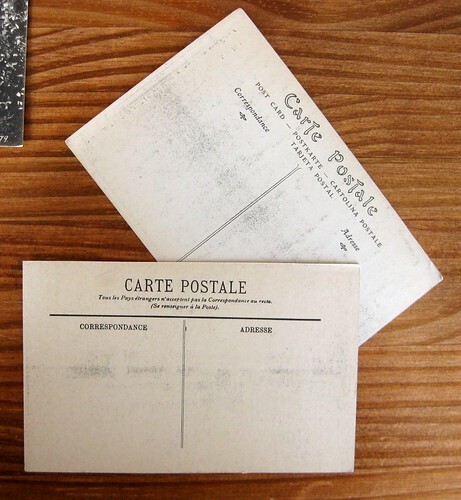 Is my historical photograph/paper age sense incorrect, or do I surmise that these may date closer to WWI than WWII? I believe the scenes are from France; they are not all labeled but the ones that are seem very French. There are a couple of chateaus. (Chateaux?) I just know that they are so gorgeous I'm not even sure I'll be able to use them! My favorite one is on top, the dungeon-looking door with the light shining through... spooky yet lovely. ...and here's another. I am honored to be the recipient of someone else's history! Okay I can tell your from sister mary margarets french class these are french even though my french is rusty yes def french and I would be a very proud owner of one of them if they were mine too . wow how generous of someone to send to you . Lovely . thanks for sharing and posting . They may be younger than they look-- they're apt to have been printed on the cheap, and the low-grade materials (pH 3 paper, for example) can age at an exaggerated rate). I have a photo bought at the Grote Kerk in Breda, NL in 1998 which has the same sort of image quality as the two on the lower left. Wow, it looks so cool. It doesn't look German, that's all I can say. I never saw a French castle, so I can't tell you if it is from there ;)! Glad you stopped by, Simply Me - and thanks for the compliments. ooo I love it. 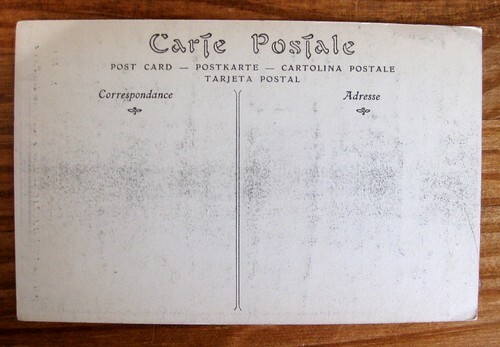 I have this deep affection for the back sides of antique post cards. There's something so captivating about their design aesthetic. I like the "dungeon" gate also. It does look like prison bars, but at the same time the quality of the light flowing in through it has a sense of freedom and airiness to it. Seems more like a window than a doorway as the bars look as though they are cemented into the archway. Gives me more of a feeling like a convent than a prison. Really nice set of vintage cards you got!